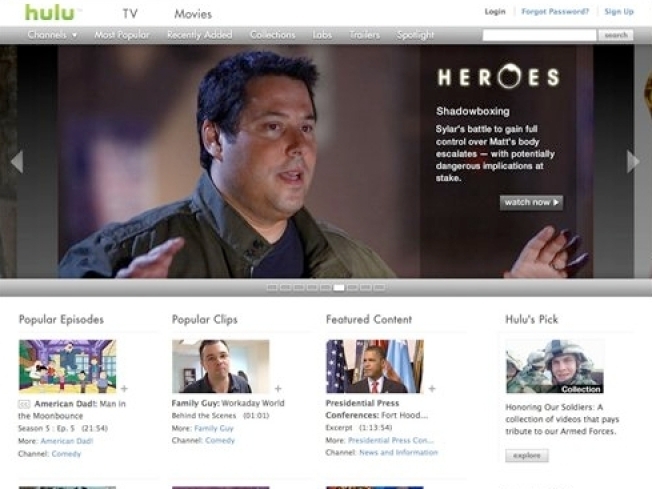 In this Nov. 11, 2009 file screen grab, the home page of Hulu.com, is shown. Online video site Hulu has launched a $9.99-per-month paid section, under pressure to generate a profit from its media company parents. Hulu's long-awaited premium service "Hulu Plus" just went live. The premium, HD service is available on the iPhone, iPad, and even certain TVs and costs $9.99 a month. Hulu Plus allows subscribers to watch every episode aired from the current season of top shows, whereas Hulu's free service limits the number of shows from the current season it makes available. The service is technically a "preview" — you can click to request a preview invite now — it'll roll out wide in coming months. Hulu, which is co-owned by NBC Universal, News Corp, Disney and Providence Equity Partners, has been talking about a subscription service for year. The site has the premium service costs $9.99 a month and will offer a wider variety of shows in high definition. Subscribers will for the first time be able to access the full current season of shows on the air right now. Hulu's free site will continue to operate. Whereas Hulu is just a website, Hulu Plus is also an application subscribers can download for free to the Apple's iPad, iPhone, and certain Samsung internet-connected Blu-ray players, and TVs. In the next few months it'll also be available on a range of Sony PlayStation 3, TVs and Blu-Ray players and in 2011 Hulu Plus will launch on Microsoft's XBox 360. This changes the game in terms of mobile content distribution — making Hulu a player like Netflix, whose free app for subscribers has been a huge hit on Apple's platform. The big question is whether Hulu's loyal users decide to pay the ten bucks a month? And will Hulu drastically scale back how much content it offers for free? Hulu Plus will include advertising — Nissan and Bud Light are the lead advertisers on board. It's odd to include ads on a subscription service, but presumably it's to offset what would be a higher fee. CBS has resisted joining Hulu, saying it's simply not profitable. The network has said it may get on board once a subscription service is in place, if it makes CBS' involvement remunerative.